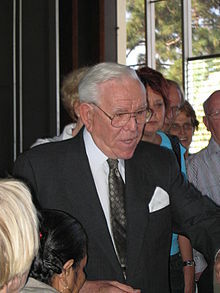 Robert H. Schuller in the Netherlands. Robert Harold Schuller (September 16, 1926 – April 2, 2015) was an American televangelist, pastor, motivational speaker, and author. He is best known for the weekly Hour of Power television program which he began in 1970. He was also the founder of the Crystal Cathedral in Garden Grove, California, where the Hour of Power program used to broadcast. Schuller was born on September 16, 1926 in Alton, Iowa. He was of Dutch ancestry, and belonged to the Reformed Church in America. He married Arvella de Haan in 1950. They had five children together. She died on February 11, 2014. Schuller died from complications of esophageal cancer in Artesia, California, aged 88. ↑ Santa Cruz, Nicole (February 11, 2014). "Arvella Schuller dies at 84; wife of Crystal Cathedral founder Robert Schuller". Los Angeles Times. Retrieved February 13, 2014. ↑ "Televangelist and Crystal Cathedral founder Robert Schuller has died", Washington Post, April 2, 2015. ↑ Obituary in the Los Angeles Times, April 2nd, 2015. This page was last changed on 24 November 2017, at 13:52.